Who was Frederick Douglass? More importantly, why does Frederick Douglass matter to today’s America? The above questions are not merely rhetorical, as the recent controversy surrounding President Trump’s Black History Month statement illustrate. “Frederick Douglass,” Trump said, “is an example of somebody who’s done an amazing job and is being recognized more and more, I notice.” The mainstream media have caste Trump’s curious mixture of both past and present tenses – ‘who’s done’ (past) vs. ‘is being recognized’ (present) - as an incongruous construction at best, and at worst as a clueless invocation of one of America’s most beloved and revered historical figures. But there is certainly an alternative view to be had. The alternative view is that whatever the President’s intended form of language or actual prior knowledge of Frederick Douglass, he is certainly an example of excellence. Furthermore, especially during Black History Month, Douglass is receiving heightened recognition. Frederick Douglass was of course born into slavery, and was possibly fathered by a member of his enslaver’s own family. Although he was illiterate as a child, his enslaver’s wife saw a deep yearning to learn in Douglass and began to teach him to read. Once her husband found out about this, he immediately put a stop to the lessons and forbade his wife from continuing to teach Douglass. The system of slavery required as a fundamental principle that slaves be kept in ignorance, lest they begin to challenge the injustice that was being pressed on them. Douglass, who even as a child realized that the secret to his ultimate freedom was knowledge, found clever ways around the reading ban. The most successful ruse involved recruiting the young white boys he befriended around the neighborhood. Many of them were hungry, while Douglass had free access to a pantry full of bread supplied by his enslavers. Douglass would always take a book out with him when he was sent on errands, and when he encountered a young friend, he would ask for help reading the words. Although some may have been initially reluctant to help him, they usually became quite eager to help once they realized Douglass had bread to share. Douglass, like any great entrepreneur, saw a means of exchanging a thing of value to others (bread) in order to receive something that was much more valuable to himself (knowledge). Douglass’ entrepreneurial approach to learning ultimately helped him gain his freedom (when he ran away from the plantation, he knew how to make his way to Baltimore because he had voraciously read and completely memorized maps and road signs). This simple yet powerful lesson is instructive of the personal power we all have to rise up from whatever personal or social circumstances that may be preventing us from achieving our dreams. Frederick Douglass deeply despised the system of slavery that was the law of the land in America. He met with President Lincoln on at least three occasions to discuss the matter, which he saw as one of our nation’s great moral challenges. He not only felt slavery was bad for African Americans (the prevailing narrative was that slaves were generally better off under conditions of slavery than many free citizens), but bad for America’s soul. Slavery caused otherwise humane, kind and devoted Christians to become covetous, deceitful and cruel. Slavery, Douglass argued, was a serious impediment to America’s ability to realize its manifest destiny. During Black History Month, Frederick Douglass and a host of other notable black historical figures receive special notice, whether it is Harriet Tubman, Booker T. Washington, or more obscure figures like Benjamin O. Davis, Sr., the first black American to achieve the rank of General Officer in the U.S. Army. This year, partly due to the media furor around Trump’s minor verbal slip, Douglass has received special interest. Bookings for visits at Cedar Hill, Douglass’ home now converted to a Museum of his life in Washington, are reportedly at an all-time high. But there is irony in only studying the example of Frederick Douglass during a month set aside for Black History – because Douglass was so much more than just an American who happened to be black. Douglass is a true American hero in the same vein as more conventional luminaries such as Abraham Lincoln and Thomas Jefferson. His writings and biographies about him should be studied within the context of American history writ large. Douglass was a notable early leader of the Republican Party. He championed the woman’s right to vote at a time when it was not politically popular. He also served as Washington D.C.’s first Post Master General – entrusted by the President to manage the most sensitive correspondence during the height of the Civil War. 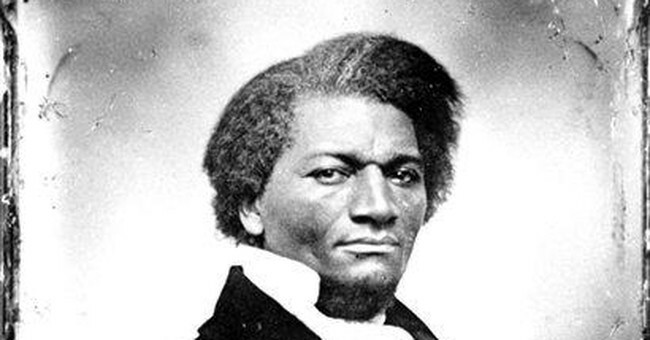 Douglass was also one the best and most sought after orators of his day. He traveled around the country extensively talking about the ills of slavery and oppression. His stance as a pro-abolition speaker and activist at the time took courage and conviction. Douglass was fond of saying, “The man who is right is a majority. We, who have God and conscience on our side, have a majority against the universe.” The alternative view is that it is great that he is being recognized more and more.